The old adage about college cuisine is that it ranges from packaged ramen to pizza delivery. I spent most of my college years on a dining hall plan, but even living off campus my senior year, I remember eating a lot better than that. One of the fascinations at the time was Thai food, which back in the late '90s was the new in vogue ethnic cuisine. Thai restaurants proliferated in the Portland area. Where I went to school, a very rural area about 5 hours drive east of Portland, you'd think Thai would be nonexistent, but there was actually a rather decent Thai restaurant in the tiny town next to the small town where I went to school (I think it might be this place). On campus, a few of us cooked up our own Thai dishes. I made an ambitious attempt at pad thai (back when people were still putting ketchup in it), and my friend Doug made a host of great dishes, including curries. 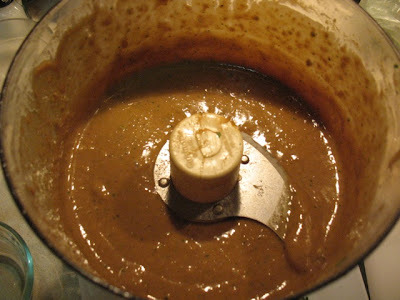 But my favorite Thai-style dish from that time was my housemate Layla's peanut sauce. It's the best peanut sauce I've ever had: silky, garlicky, tangy, a little spicy and just all around peanut-y good. One afternoon, Layla did some demonstration cooking for me and my housemate Julieanna to show us how it's done. It's really pretty easy: it all comes together in the food processor. Mince the garlic, ginger, jalapeño and cilantro in the food processor. Then add the remaining ingredients, saving the honey, curry powder and sesame oil to be added last. 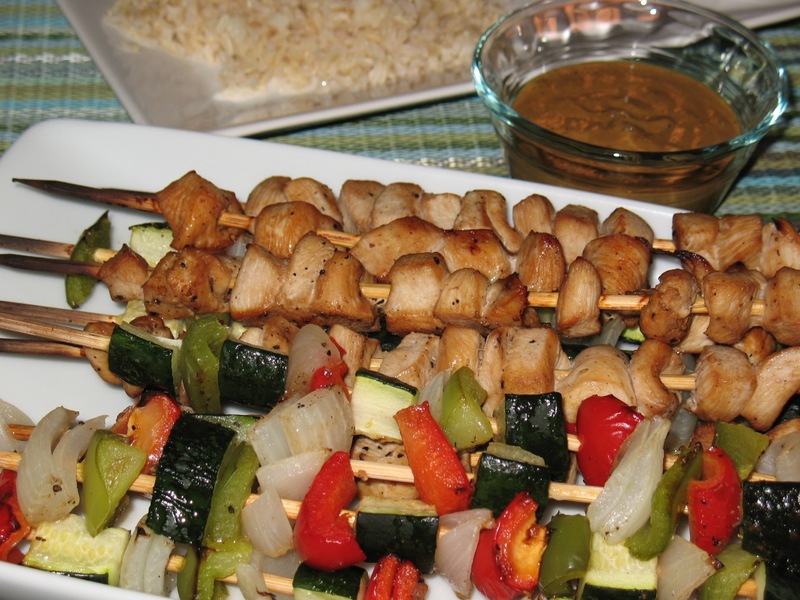 To keep the focus on the flavor of the wonderful sauce, I served it with simple broiled skewered vegetables and chicken with brown rice. The chicken I marinated in soy sauce, hoisin sauce, sesame oil, garlic and ginger. The vegetables I brushed with canola oil and seasoned with salt and pepper. Modest as she is, Layla claims that the peanut sauce recipe comes from the now defunct Portland eatery Caprial. However, to me, it will always just be Layla's Peanut Sauce. Combine the ginger, garlic, cilantro and jalapeño in a food processor. Pulse a few times to mince ingredients. Add vinegar, soy sauce and peanut butter, and process until well combined. Scrape down the sides with a spatula and add the curry powder, honey and sesame oil. Process until sauce is smooth. Serve in ramekins alongside foods for dipping or combine with rice, meats or cooked vegetables. 2. Stir together soy sauce, hoisin sauce, sesame oil, ground ginger, garlic powder and pepper and combine in a large bowl with chicken. Set aside to marinate. 3. Preheat oven broiler with oven rack about 4-5 inches from element. 4. 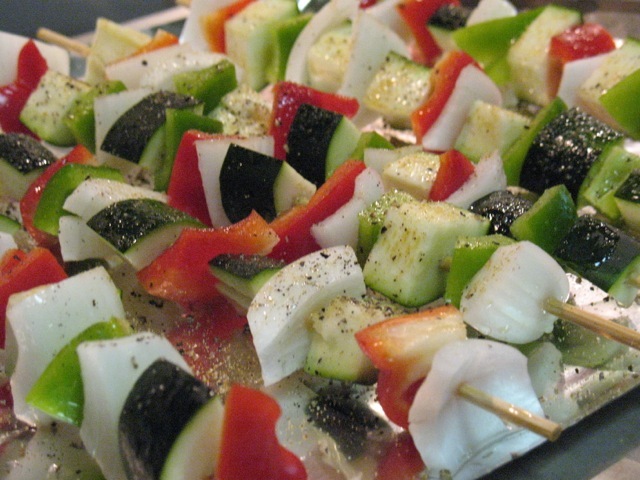 Thread alternating types of vegetable pieces onto six of the skewers. Place on a baking sheet and brush with canola oil. Season with salt and pepper. Broil about 4 minutes, turn skewers, and broil another 3-4 minutes until cooked and lightly charred on the edges. Remove from oven. 5. While vegetables cook, thread chicken pieces onto the remaining skewers. 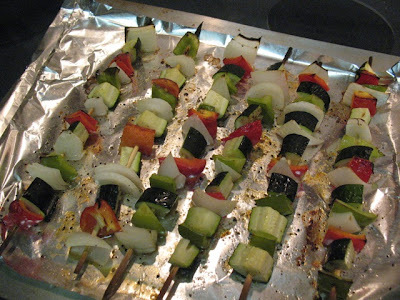 When vegetables come out of oven, put chicken skewers on a baking sheet and broil for about 8-10 minutes, turning halfway (chicken takes a little longer to cook than the vegetables, hence the separate cooking). Remove from oven. Serve with brown rice and Layla's Peanut Sauce from above. Thanks for the awesome peanut sauce recipe, Layla!